It doesn’t happen often, but Warsaw will take it. For a program that has played in the semi-state four times in the last 11 years, Oregon-Davis hasn’t been on the wrong side of blowouts. But for the third time this season, the Bobcats gave up 80-plus points, and Warsaw hung 89 points at the Tiger Den. Coming into the night averaging 43 points per contest, the Tigers had four players in double figures, another with nine, and hit eight three-pointers on the night. Warsaw hadn’t scored 89 points since dropping 97 in a sectional game against Elkhart Central in 2001. The Lady Tigers hadn’t hit 80 points since a win over Concord in 2016. Halle Shipp had a breakout game with a career-high 15 points, Maddie Ryman led the team with 19 points, Kaylee Patton chipped in 16 points and Brielle Harrison finished with 10 points. Abby Sanner was one off the mark with nine points and was one of four players with five rebounds, joining Patton, Ryman and Mackenzei Sokol. Mercedes Rhodes led O-D (4-3) with 22 points. Warsaw’s JV took on LaVille and had no trouble in a 41-11 blowout. Warsaw gave up just two baskets in the first three quarters of play, running out to a 37-4 lead after three quarters. Bailie Stephens paced the Tigers with 10 points and six rebounds and Cora West had nine points, eight steals and four rebounds. Nine different Warsaw players scored in the game and the team collected 22 steals and 35 rebounds in the game. Warsaw (5-4) visits Portage Saturday night. Valley found itself chasing Plymouth all night as the Pilgrims kept its distance over the host Vikings. Plymouth (7-1) started the night with a 15-9 lead after one quarter, and held a tenuous three-point lead, 24-21, at the half. A 16-10 run in the third put the visitors up nine at 40-31 into the fourth, and Plymouth made the advantage stand up to close out the win. Sophie Bussard did what she could, totaling 16 points, six rebounds, five steals and four assists and Emma Craig had 11 points and seven rebounds before fouling out. Valley missed out from behind the three-point arc, making just 1-12 attempts. Valley (5-3) will jump into Three Rivers Conference play Saturday in taking on Wabash. Casey Schroeder returned to the Wawasee lineup, but the long trip to South Bend didn’t yield a win for the Lady Warriors. Schroeder had 12 points and eight rebounds in her return from injury, but hit just one field goal in the second half. All 12 points came on three-pointers made. Danielle Jenkins and Hannah Lancaster added five points and Madison Mottern had six points in the loss. Makiah McCain led the Eagles (1-5) with 18 points. Wawasee held Adams to just two field goals in the first half of a 27-16 JV win. 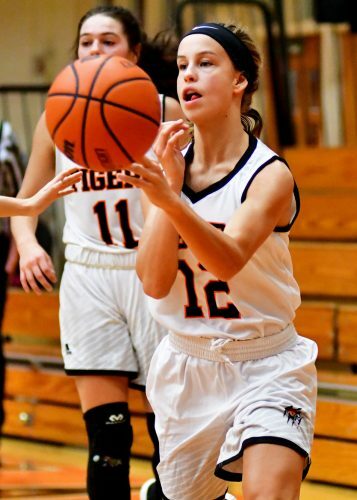 Ava Harker paced the Wawasee juniors with eight points and five rebounds and Kennedy White added some defensive grit with eight rebounds and five steals. Wawasee (2-6) will start Northern Lakes Conference play Tuesday in visiting defending champion Northridge.